Above: A southbound parcels train at Grantham on Thursday 22nd August 1963, hauled by class A3 No. 60054 Prince of Wales of Grantham shed (34F). This is thought to be the Delaval Sidings (Scotswood, Newcastle) to Holloway (North London) empty stock train 3E30, timed to pass Grantham at 7.30pm. I have compiled the following table from a copy of the Summer 1961 Working Timetable which I borrowed in the late 1970s, having become interested in Grantham after purchasing one of Colin Walker’s books. 1C49 King's Cross (dep 02:00) - Grantham (terminates) *see note below table arr 05:04 3h 4min Newspapers and parcels. * The King's Cross (dep 02.00) newspaper and parcels train 1C49, which arrived at Grantham at 05.04, included vans that were forwarded to Boston and Lincoln. 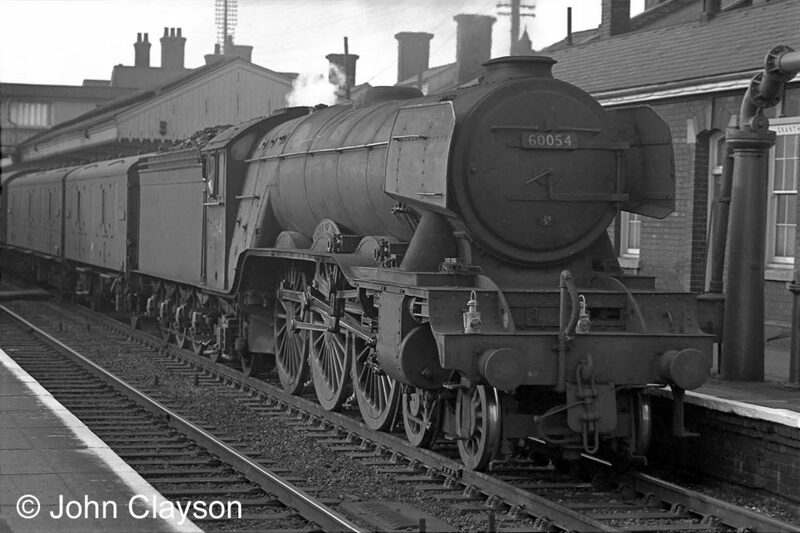 The vans would be attached to local passenger services which departed for Boston at 05.50 and Lincoln at 07.33. By 1961 these local services were normally operated by diesel multiple units (DMUs), known to Grantham railway staff as 'railcars'. A diesel muttiple unit with a van attached departs from Syston (Leicestershire) for Leicester London Road on Sunday 9th August 1964. Photograph taken by Cedric Clayson. The parcels trains were run at express passenger speed while on the move, but many of them stopped frequently and for quite long periods for loading and unloading, resulting in some long journey durations. Typically, a train heading north from King's Cross could make stops at Welwyn, Peterborough, Grantham, Newark, Retford and Doncaster on the way to York. Because many of the workings were at night there are not many sightings of the locomotives that were used. Generally, because they travelled at high speed they would be hauled by pacifics; V2s and 9Fs were also employed. During the summer of 1961 English Electric Type 4 (later class 40) diesels began to work regularly on certain daytime parcels workings. Royal Mail Travelling Post Office (TPO) vans would make an appearance on certain night services to Scotland. Single parcels vans would often be attached to daytime express passenger trains, while several would be part of the overnight sleeper trains that ran to Newcastle and Scotland. 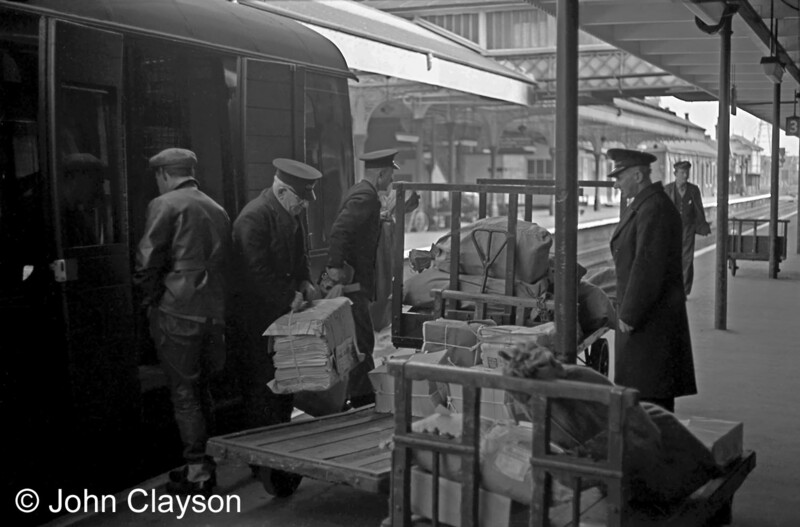 Porters and GPO staff are busy loading mail and parcels onto a northbound passenger train at platform 3 on 18th April 1963. The mail carried on parcels trains was either ordinary mail, registered mail, parcels or newspapers. 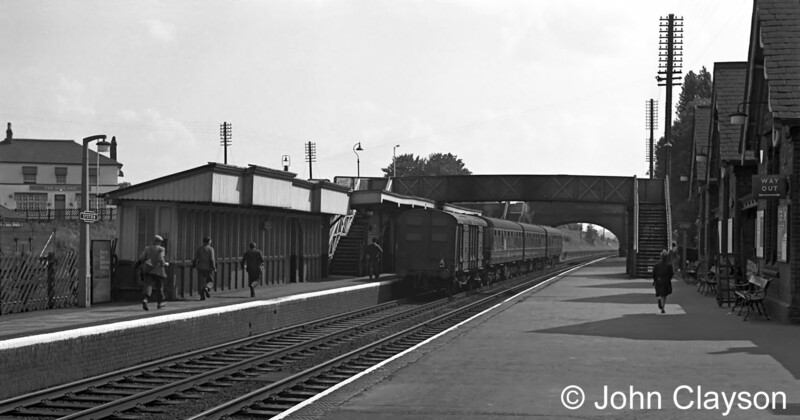 A northbound train has stopped at platform 3 on the afternoon of Thursday 9th April 1964. Porter Bob Carpenter, second from the left, is unloading what appear to be newspapers, consigned to Lincoln, onto a railway trolley. 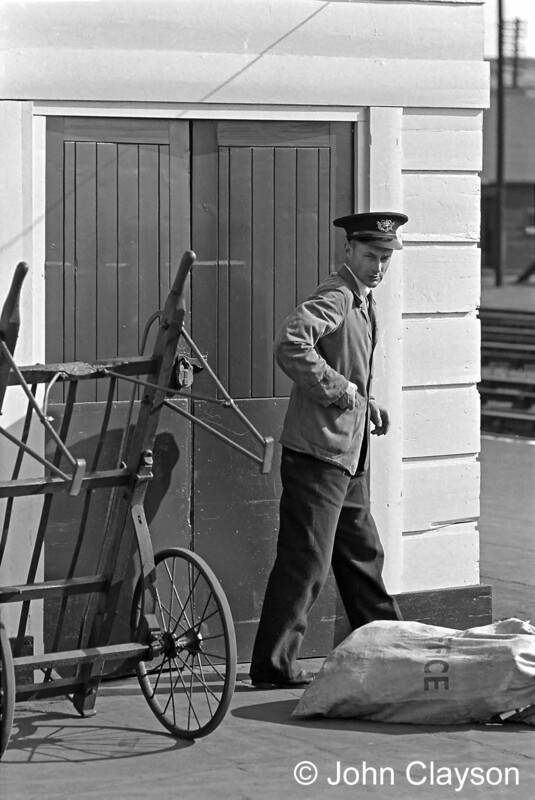 Behind him a GPO worker is carrying mailbags to a post office trolley. A station Inspector looks on. His job is to ensure that these station duties are carried out efficiently so the train can be dispatched without delay. As well as the main line parcels services, mail and parcels were loaded onto, and offloaded from, local passenger trains for Nottingham, Sleaford, Boston and Lincoln. 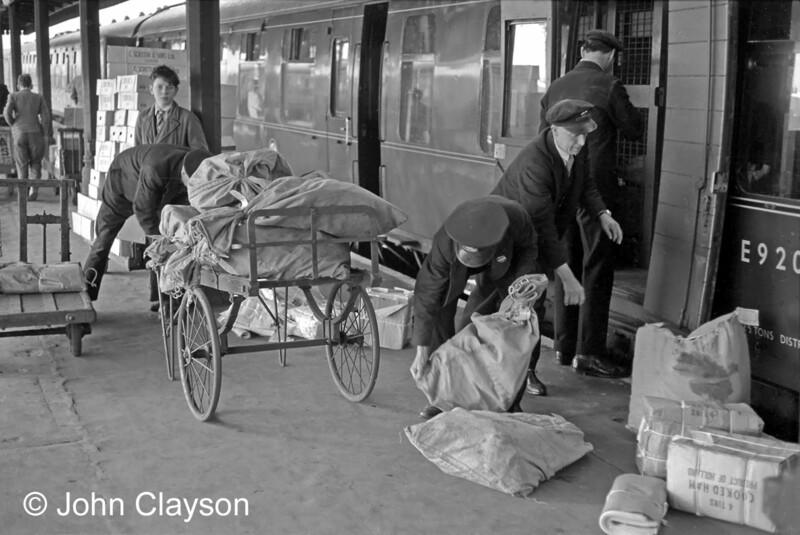 Porters transferring luggage, including parcel post mail bags, on platform 1, the 'Lincoln bay', at Grantham on 16th April 1964. The train is formed from a Derby-built diesel multiple unit (DMU), or railcar, with driving trailer composite car No. E56000 at the north end. The man nearest the door with his face towards the camera is Jack Duncan. At this time a Mail Room at Grantham station was situated at the south end of the Down platform. 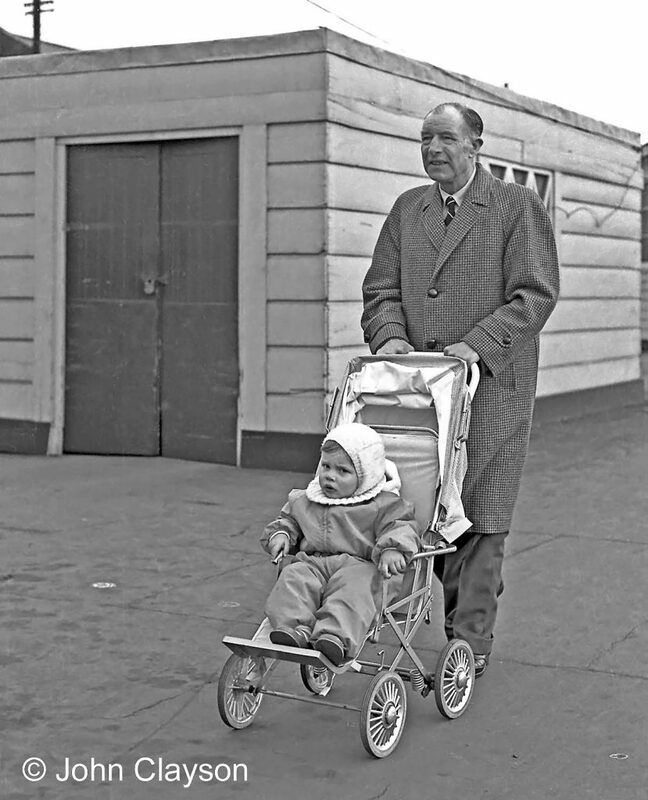 The Mail Room forms the backdrop to this photograph of a young passenger, presumably with grandad, as they take a stroll along the Western platform on 9th April 1964. Another view of the Mail Room on the Down side, a wooden building with doors secured by padlock, providing secure accommodation for mail awaiting a suitable train. The man is a GPO employee, and the barrow is GPO property. Mail to and from the Grantham area was transhipped between the station and the main post office in the town using road transport. A supply of barrows was kept at the station for carrying mailbags between the GPO vans and the platforms. Newspapers were delivered for W H Smith, who were located at the station, and local newsagents. This is Harry Reedman, manager of the W.H. Smith station bookstall, standing on the boarded crossing to collect a delivery of newspapers from the Down side main line platform on 18th April 1963. 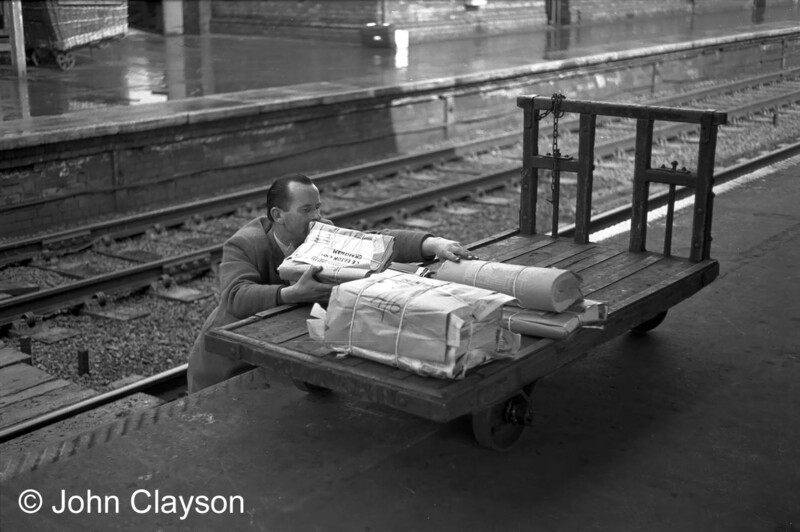 In his right hand is a package containing 15 copies of the Stock Exchange Gazette consigned from Kings Cross to C.E. Eaton & Son of Grantham. Eaton's had a newsagent's shop and a wholesale news business supplying the station bookstall. The bookstall was on the Up side, next to the station entrance, but most papers, printed in London, arrived on trains calling at the opposite platform. Hopefully Harry will be observing the signals which will warn of an approaching train. Follow this link to Mailbag Memories, stories about postal work at Grantham station. Wonderful images of a bygone era . Amazing scenes long gone. I especially liked the picture of Harry Reedman standing on the crossing. If someone did it now I guess they would be sacked!